Beech Hill Pond in Ellsworth (DeLorme’s The Maine Atlas and Gazetteer (MAG), Map 24, C-1) that currently boasts being the birth place of the state record togue, a 31 pounds 8 ounces monster caught by Hollis Grindle in 1958. Other state favorite waters, among togue fishermen, include Moosehead Lake with excellent boat launches located in Greenville (Map 41, D-2) and Rockwood (Map 41, A-1) and Sebago Lake (Map 5, D-1 and C-1). In Washington County, East Grand Lake (Map 45, A-4) and West Grand Lake (Map 35, B-3, B-4) both are extremely popular destinations, rich with fine fishing opportunities for trophy sized fish. While an average togue, in Maine waters, typically runs between 2-4 pounds, the chance of an angler hooking into a much larger sized fish is always a distinct possibility. Anglers chasing togue in March, depending on the season’s weather, typically enjoy fishing for togue through the ice as well as via open water trolling. To maximize the chance of finding and landing one of these impressive wall hangers, it helps to understand a little bit about togue, their habits and the habitat in which they live. Togue are a cold water game fish that requires deep, cold lakes that hold plenty of dissolved oxygen. As water temperatures warm as winter turns to spring and then summer, togue sink deeper and deeper into the depths to inhabit waters that are less affected by the warmth of the sun. In March, however, togue can be found feeding on the surface and ice anglers can catch them by using smelts just under the ice. Typical for this time of year, on West Grand Lake, more togue will be caught on tip-ups rigged for salmon than on togue rigged tip-ups set in deep water just a few feet off bottom. If trolling, spoons or minnow imitation plugs works great and lures such as Rapala Husky Jerks and Shad Raps or spoons like the Williams Wabler or Mooselook Wobbler in silver or silver/blue are all time tested favorites. Primary feeding times occur during early morning and late evening, so fishing efforts should be concentrated on these prime times. Feeding times can be extended on rainy, cloudy or foggy days so plan to fish later if these weather conditions exist. My shot hit low, sending specks of gravel flying in all directions. Amazingly, the coyote stood as still as a statute, likely trying to decide in which direction he should make his rapid escape. The pause left me with an additional shot opportunity and this time I didn’t miss, the round from my .223 dropping him squarely in his tracks. Pacing out the distance, I quickly realized the cause for my initial missed shot. I had originally estimated the distance at 200 yards but as my footfalls piled up, the number of yards between us edged closer to 250 yards. The extra yardage had caused my first shot to hit a full 4.5 inches lower than I had anticipated. Only luck had allowed me to capitalize with a second shot, a bonus opportunity typically lacking when hunting most game animals. The lesson to be learned is that yardage can be extremely difficult to effectively judge, especially when hunting large expanses of open terrain. Possessing even a budget conscious (under $200) range finder, like the Bushnell Truth, Redfield Raider 600, Simmons Volt or author favorite, the Nikon Aculon, allow sportsmen to precisely measure distances to targets and adjust shot opportunities as necessary. Once dialed in, predator hunters will enjoy pursuing long distance coyotes on down east Maine’s expansive frozen lakes and immense blueberry barrens. Coyotes frequently can be seen, in the early evening and at dusk, patrolling edgings for food. The Ridge Road in Cherryfield (Map 25, D-3 and C-3) snakes past Schoodic Lake (Map 25, C-3) and terminates at Crebo Flat (Map 25, B-3), providing access to great long distance shooting possibilities. 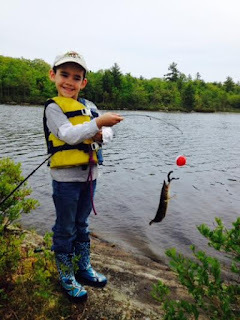 Adults looking to take junior anglers spring fishing should check out Foxhole Pond (Map 25, C-2). The pond is regulated by an S-11 rule allowing fishing only by persons less than 16 years of age. IFW regularly stocks the pond with brook trout, including spring yearlings 7-9 inch, fall yearlings 12-14 inch and 16-18 inch retired brood stock. The daily bag limit on Foxhole Pond is 2 brook trout with a 6-inch minimum. To access Foxhole Pond, travel north on Rt. 193 from Cherryfield for approximately 8 miles. After passing Wyman’s Blueberries, a sizeable blueberry field will appear on the right with a large radio tower. Take the dirt road after radio tower. The first road encountered on the right is the old hatchery road, the second road on the right, leads to Foxhole Pond. A short drive and the small pond will appear through the trees, on the left side of the road. It is a privilege to have access to this pond, so visitors should make sure to pack in and pack out any garbage.